However when there is a less than obvious link between brand and logo my curiosity is piqued and I want to find out the story behind the icon. While not as strange as the dead lion logo to be found on tins of Tate & Lyle (a story I’ve told previously), I couldn’t immediately see a link between a Boar’s Head and Gordon’s Gin; curiosity suitably piqued I began searching. I wondered if the gin had first been served, or was first distilled, at an Inn called the Boar’s Head. There are numerous pubs and inns called the Boar’s Head, most famously it is the name of the tavern in Eastcheap where Sir John Falstaff, Prince Hal and other characters in Shakespeare’s Henry IV plays meet. 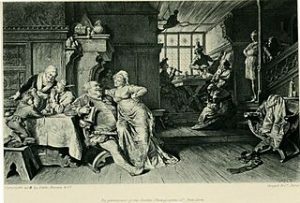 Some believe Shakespeare may have taken the named from an earlier tavern in nearby Southwark, which went by the same name. The original distillery where Gordon’s Gin was produced was in Southwark but it’s not the reason for the logo. I wondered if drinking too much made you wake up with a ‘Boar’s Head’. Alas not the reason either. 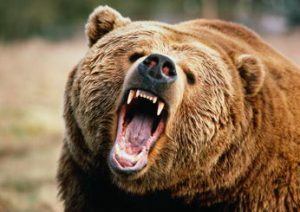 There is of course a phrase to “be act a bear with sore head” which doesn’t mean drunk, but very irritable and annoyed. I wondered if it was to do with a famous boar and gin recipe. 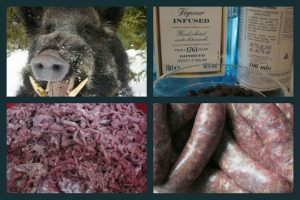 An appetising idea and I’ve found numerous delicious sounding dishes to try – Roast Haunch of Wild Boar with Gin and Blackcurrant Liqueur, Gin and Wild Boar Sausages and the wonderfully named Drunken Boar but again it’s not the reason for the logo. The reason is in many much simpler. 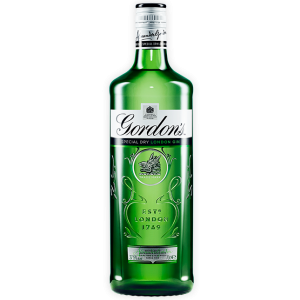 Gordon’s Gin was, as you might have guessed, created by a man named Gordon – Alexander Gordon. In 1769, he built a distillery in Southwark an area that at the time was well known for its excellent, clean water supply and he started to produce his brand of gin. 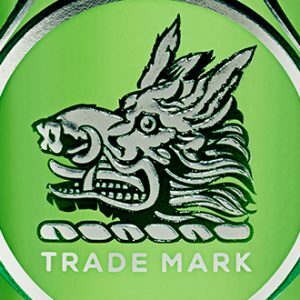 When it came to designing a label, it was for him only natural that it should include something from his clan and its coat of arms and that is where the Boar’s Head comes from. Legend has it that a member of the Gordon clan saved the King of Scotland from a wild boar when out hunting and in honour of that the King let them include a boar’s head on their coat of arms. Today Coca Cola is undoubtedly one of the world’s greatest brands, not only present, but successful in hundreds of countries. It wasn’t however always like that. Up until the late 1930s, Coca-Cola’s only real international success was in Germany where sales records were being set and beaten year after year. By 1939, Coca-Cola had 43 bottling plants and more than 600 local distributors there but storm clouds and even worse Stormtroopers were massing. A trade embargo was imposed which put a halt to the supply of the key ingredients necessary for the production of Coca-Cola syrup. To potentially further complicate things the man who had been in charge of Coca-Cola’s operations in Germany, American-born Ray Powers, died of injuries received in an automobile accident in 1938. 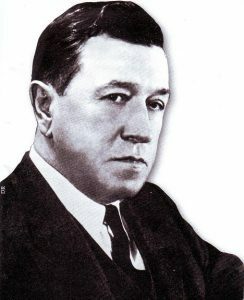 German-born Max Keith, took over. He was committed to trying to keep production going and keeping people employed. He decided to create to try and create a new product but knew that would only get access to what he later called the “leftovers of leftovers”. Using whey and apple pomace – the skins, pulp, seeds, and stems of fruit that had already been pressed – he and his team created a a light-colored drink that resembled ginger ale. The new product needed a name and so Keith called together some employees for a competition. He told them to let their Fantasie [Geman for fantasy] run wild. Upon hearing that, veteran salesman Joe Knipp immediately suggested “Fanta”. Fanta was a success despite its flavour varying depending on what fruits and other leftovers were available. In its earliest incarnations, the drink was sweetened with saccharin, but by 1941 Keith and is team were allowed to use 3.5% beet sugar in their recipes. 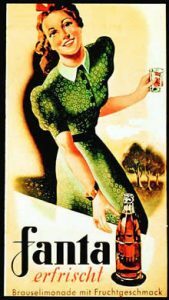 In 1943, 3 million cases of Fanta were sold enough to keep the plants operating and Coca-Cola people employed. While all this was happening executives at Coca-Cola in Atlanta did not know if Keith was still working for the company or for the Nazis. Communication with him was of course impossible. After the war though an investigator commissioned by Coca-Cola examined Max Keith’s actions and they were delighted to hear that Keith had not only never been a Nazi, he’d repeatedly rebuffed pressure to become one, suffered hardships because of those refusals. He had also resisted the temptation of selling Fanta under his own name. It is now recognised that it was thanks largely to Keith’s efforts that Coca-Cola was able to re-establish production in Germany almost immediately after World War II. 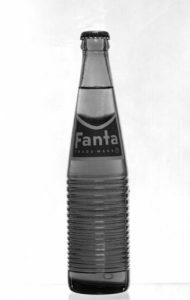 As for Fanta it was discontinued but as competition in new flavours increased in the 1950s, it was relaunched in 1955. Nowadays, while Orange is the main variety, there are more than 100 flavours worldwide. And the moral is innovation is sometimes driven by necessity not desire. What challenges are you facing which could inspire your next innovation? 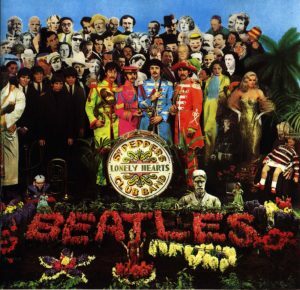 It was 50 years ago today that Sgt Pepper taught the band to play. The twenty year anniversary having long since passed. It was 50 years ago today that Lyons Maid taught the people to lick. So it was that I found myself, not on a boat on a river, but in my sitting room listening to the remastered Sgt. Pepper’s Lonely Heart Club band while enjoying that wonderful concoction of strawberry fruit ice and vanilla ice, that had been dipped in chocolate and coated with hundreds and thousands. Noticing the 50 years anniversary mentioned on the lolly’s label I got to wondering ‘who was Fab first/’, and whether there was any connection between the two. It turns out that there was something else completely FAB that was launched that year and it was this that inspired the ice lolly. Gerry Anderson’s new television series “Thunderbirds” hit TV screens that May and introduced us to Scott, Virgil, Brains, Parker and of course Lady Penelope. Set between 2065 and 2067, Thunderbirds follows the exploits of the Tracy family, headed by American ex-astronaut turned multi-millionaire philanthropist Jeff Tracy. He is a widower with five adult sons: Scott, John, Virgil, Gordon and Alan. The Tracys form International Rescue (IR), a secret organisation dedicated to saving human life. “Nothing! In the 60’s the buzz-word was “fabulous”. This was shortened to FAB and used simply as a call sign like ‘Roger’ or ‘Ten-Four’ to acknowledge received instructions. If it was an acronym, then the best suggestion we’ve heard for a potential meaning is “Fully Acknowledged Broadcast”. So back to the lolly. It was created primarily to try and attract the 3 million girls in Britain aged 5-15. The boys had been catered for when Lyons had introduced the rocket shaped ‘Zoom’ lolly in April/May 1963, off the back of the Steve Zodiac Fireball XL5 TV series. The original lolly packaging appears to have had a prominent image of Lady Penelope on the wrapper. 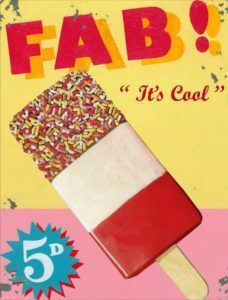 So the Fab lolly was launched in May 1967 and so too was Sgt Pepper, so is this a draw? Well it seems that the term “Fab four” was applied to the Beatles in or around 1964 so maybe they win on a technicality. 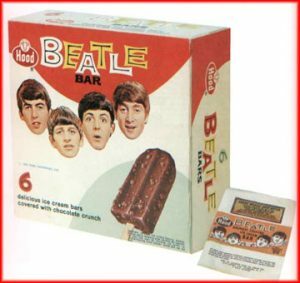 Furthermore the Fab Four also competed directly with Fab in the lolly wars for a while as ‘Beatles Bars’ were launched – ‘delicious ice cream bar covered in chocolate crunch’ on a stick (though unlike Fab lollies they are no longer available). Whatever you decide, for me they will both always be undoubtedly FAB and the only question remaining is whether they will still feed me, when I’m sixty-four.